First I layed out strings to mark the boundaries. I bought some ten-foot redwood 4x4 posts and a right-angle drill, and with Tom and Pavani's help we started installing posts in their concrete anchors. We had a good pipeline going: I measured and cut posts, Pavani soaked each cut end in a bucket of preservative for three minutes, and Tom screwed the posts into their brackets. 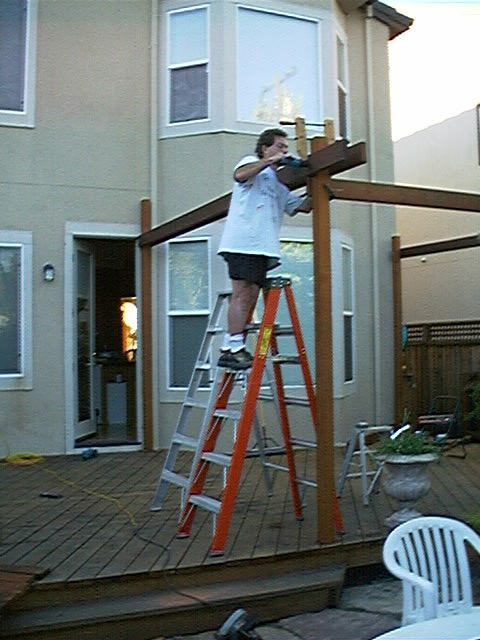 When most of the easy posts were in place we attached dual 2x6 beams to the posts to make sure everything was going to work out right. With help from Will and Nick, I dug some trenches between the beams, so that I'll have room to crawl under the deck if I need to make repairs later, or make other changes like installing power lines for lighting. 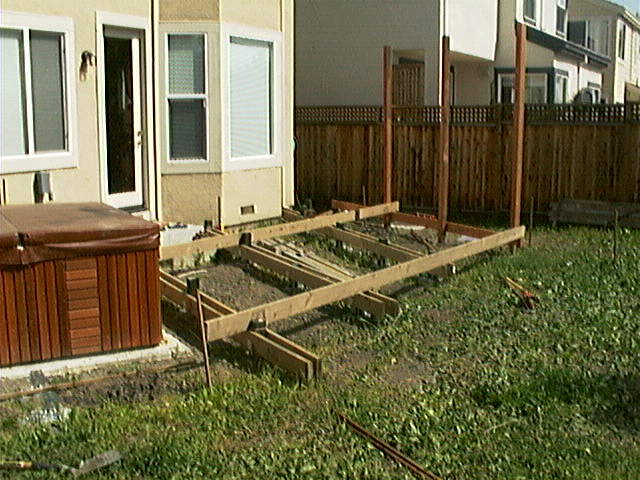 I installed some more posts and beams and laid out some joists at right angles to get an idea of how all the parts are going to fit together. 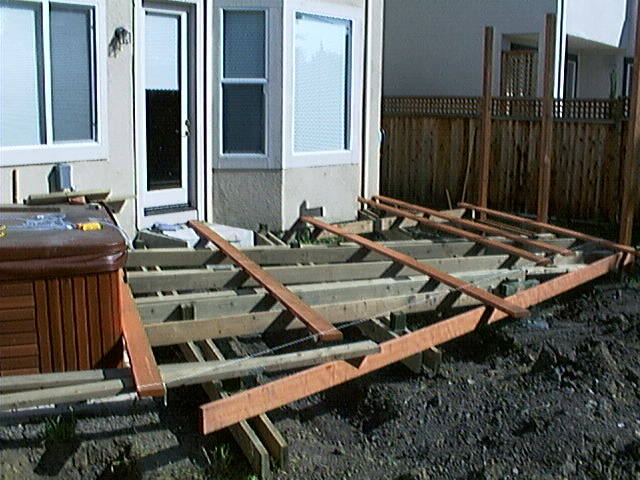 I started working out where the decking is going to go. The white string marks where the ends of the planks come to. 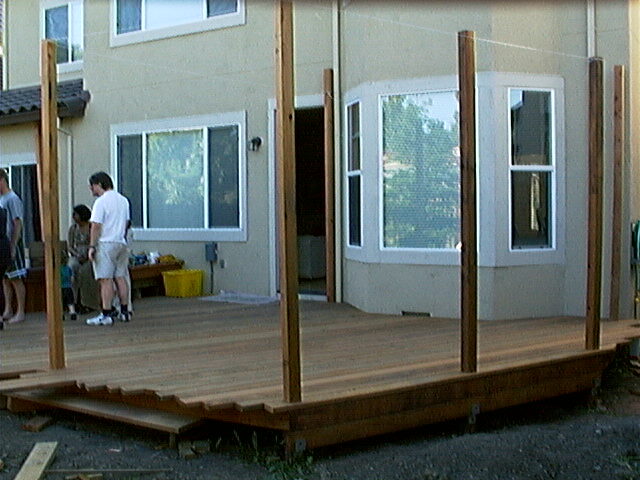 The long redwood plank at the front is the "rim joist" and shows where the planks are supposed to come to. 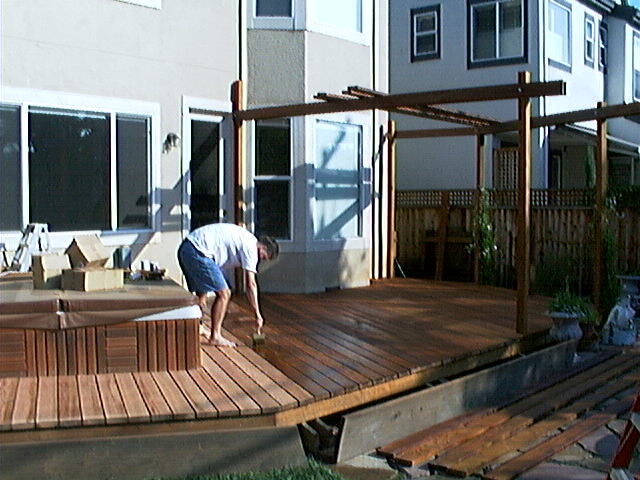 Hmm... it looks like I am going to have to order some 18 foot planks. Wednesday and Thursday I had to go to work, and I returned to working on the deck on Friday. 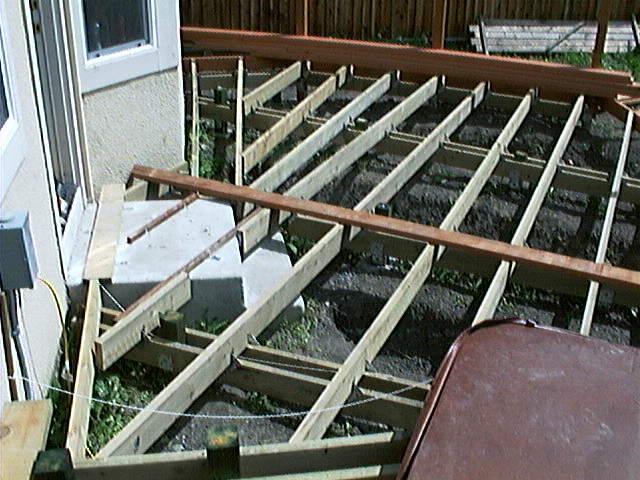 Now the deck has a rim joist all around the front edge, and the first two interior joists are screwed in place. 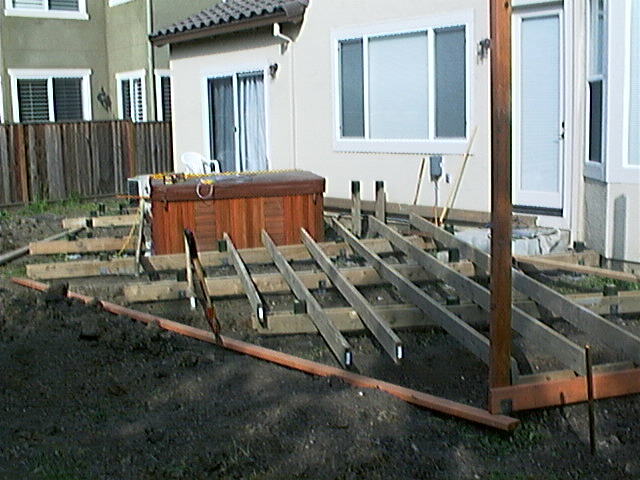 All of the joists are screwed into place, ready for the decking planks to be attached. 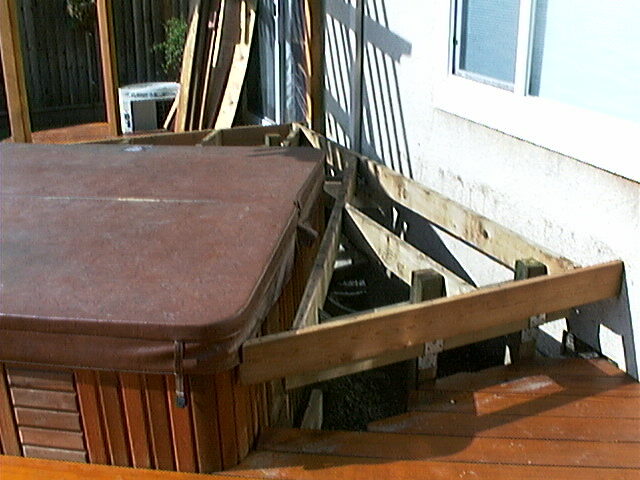 All of the decking planks are supposed to be firmly attached to underlying wooden joists, so I installed some pseudo-joists over the concrete steps to give me something to screw the planks to. 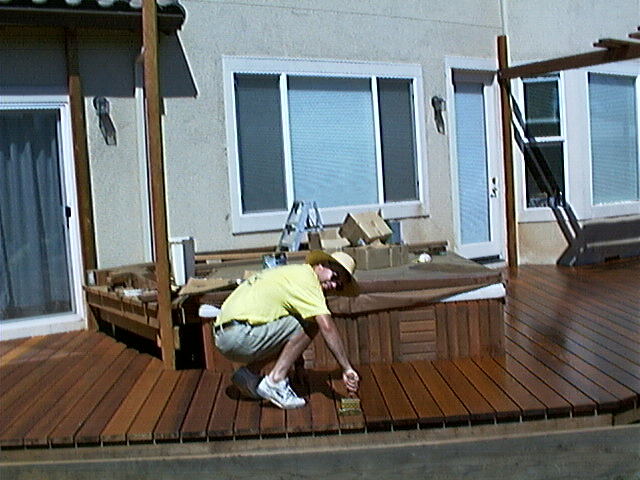 I started cutting decking planks to the right length and laying them out. 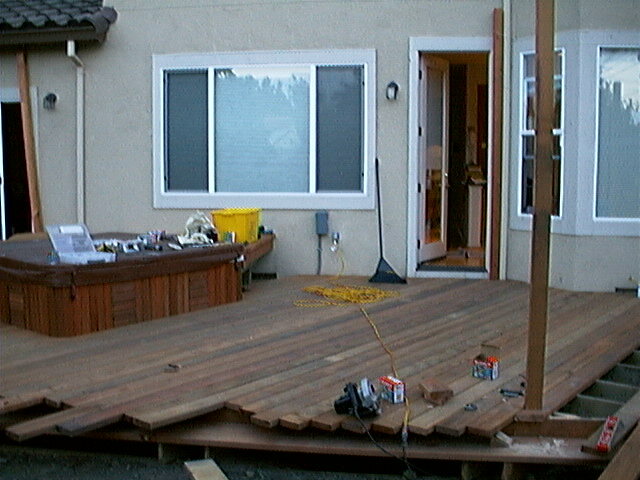 They're not screwed down yet, but at least it is starting to look like a deck. Unfortunately I lost the race. 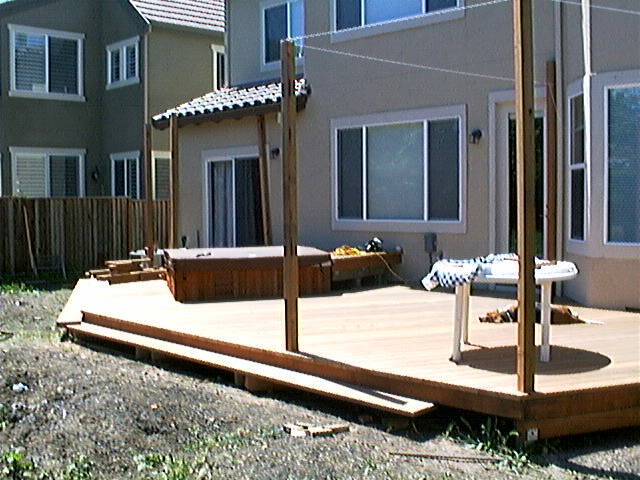 I bet Nick that I would have my deck finished before his pool, but the lumber yard has no 18-foot redwood planks left so now I have to wait two weeks until they get some more. (How can a large lumber yard be out of wood for two weeks?) Wednesday and Thursday I had to go to work, and I returned to working on the deck on Friday. I talked to Cindy at the lumber yard again. She said they don't usually allow customers to sort through the wood piles and pick out individual planks, but since they have so little stock left, she said they would let me go and sort through the 18-foot and 20-foot piles to see if I could find any acceptable planks. I found twenty I can use. 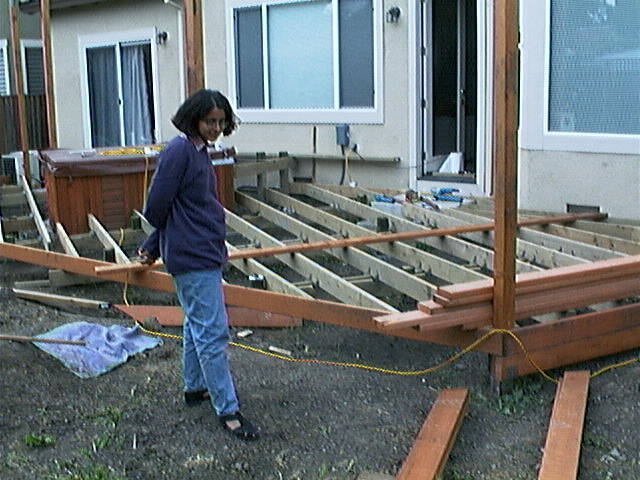 A lot of them aren't straight, but for decking that's fine  straightening the planks as I screw them in is not very hard. 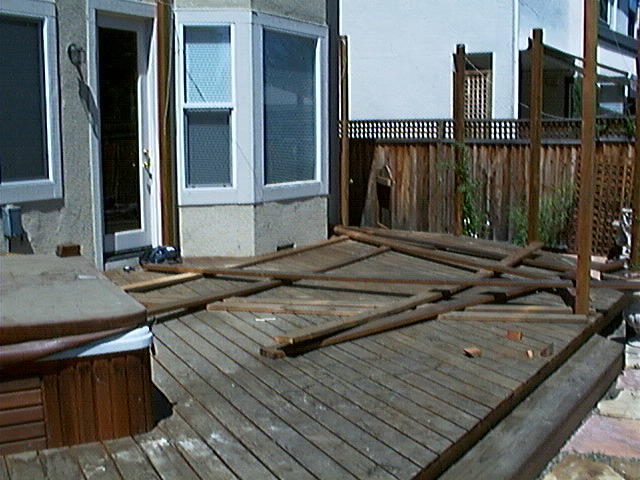 After I sorted out the wood problem I got back to work on the deck. 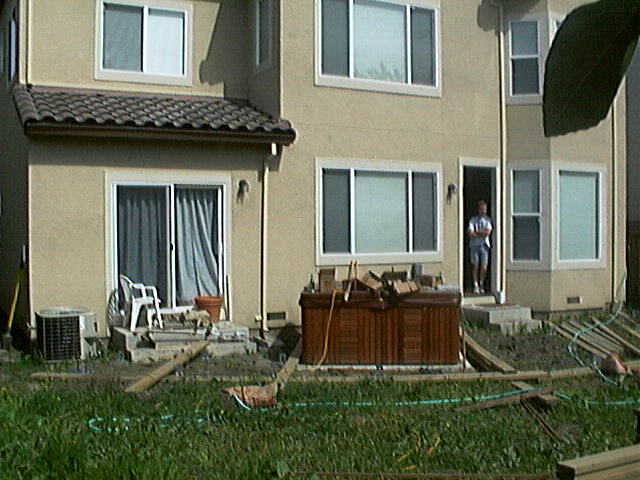 All of the planks in front of the hot tub and to the left of it are now properly screwed into place. 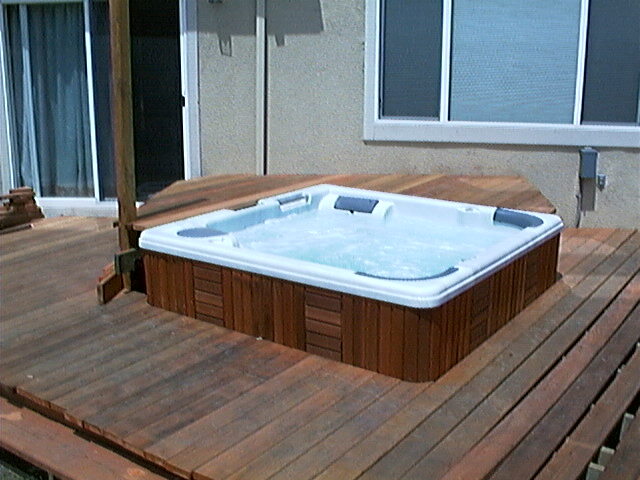 Tom worked with me all day and we completed the seat around the back of the hot tub. 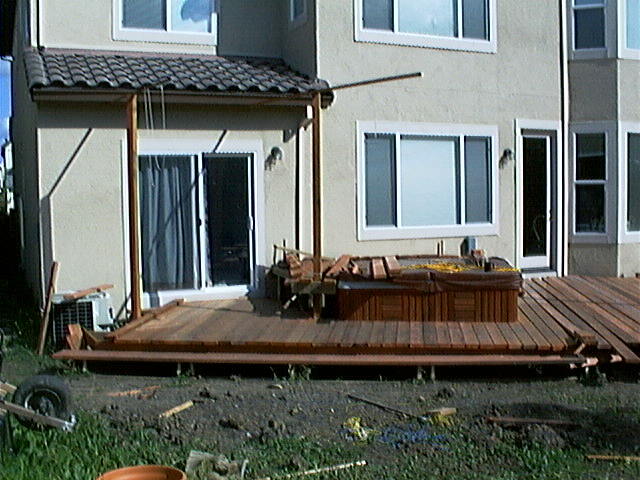 Today was a bit of a slow day, but with help from Maf and Graham I got the first eight of the long planks closest to the hot tub screwed down. Some of them were very warped, which meant we had to straighten each one before screwing it down, which was time consuming. 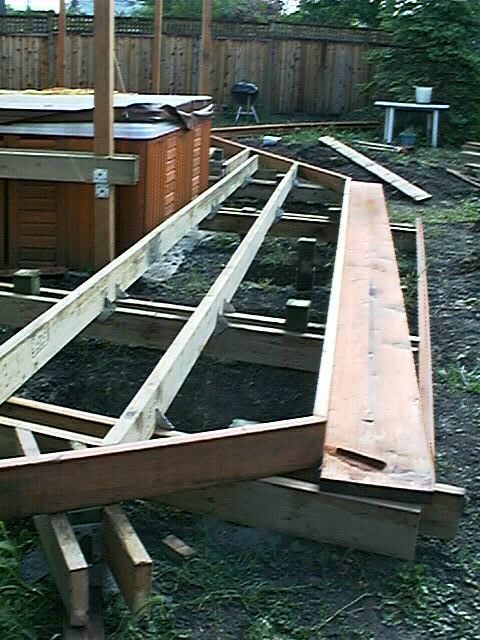 I'll trim off the uneven front edges last, after all the planks are in place. Brian Wilson also put in one screw, somewhere in the middle of the third plank. Monday-Friday I had to attend the Apple Worldwide Developer Conference and I returned to working on the deck on Saturday. Maf and I layed another sixteen planks. We averaged about fifteen minutes per plank, so that meant we spent four hours just screwing planks down, not counting other work. 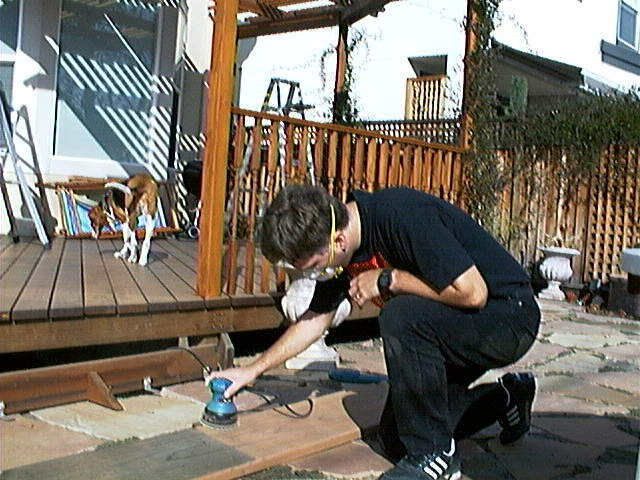 We also had to cut the ends of the planks at an angle where they meet the house, and we had to do some intricate trimming of some planks to fit around obstacles like posts and drainpipes, and that took a lot of time too. All in all, a good day's work. 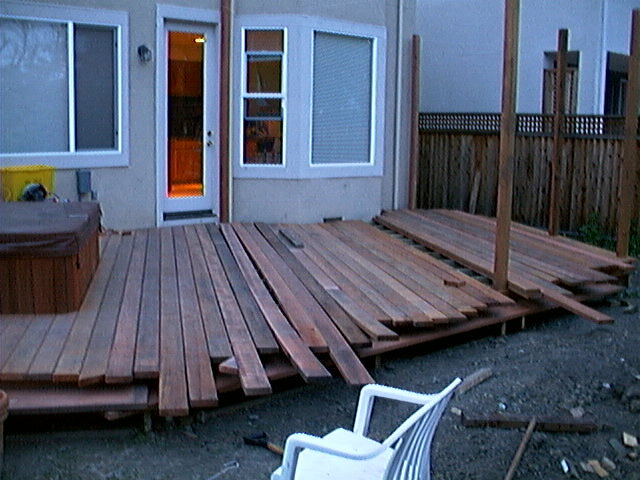 Maf and I screwed down the last fourteen planks. 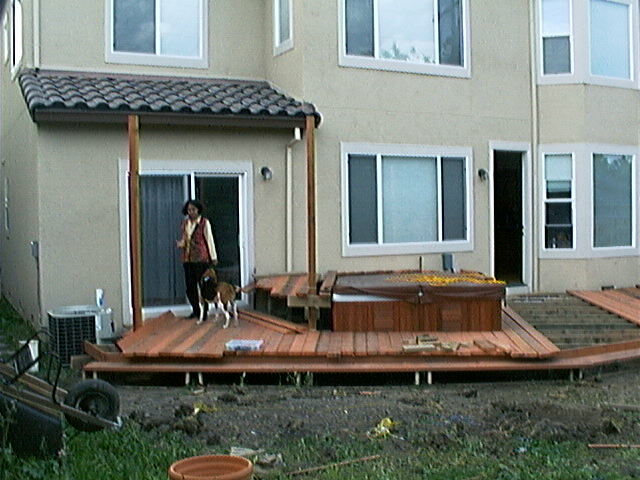 Now the front edges are neatly trimmed, and there's a dog and a picnic table on the deck. 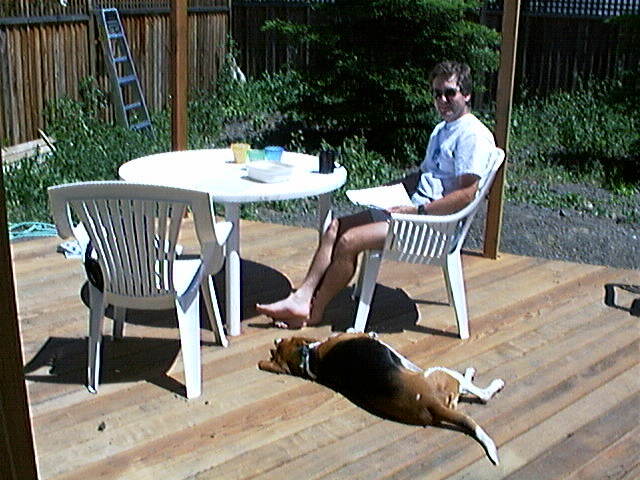 Now the deck is finally functional, and here I am working on my paper for IEEE Transactions on Networking. 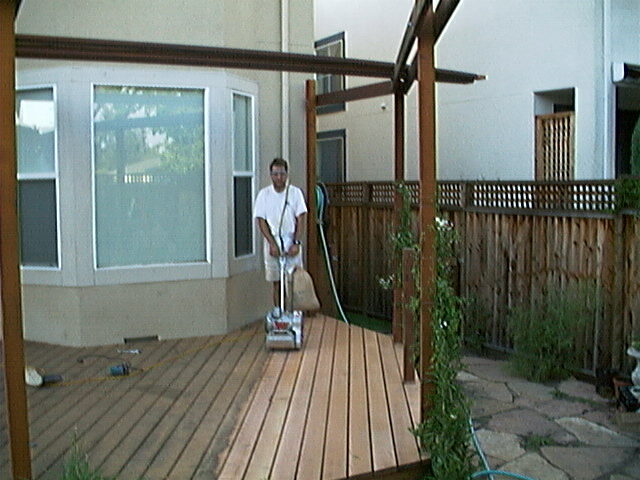 Overhead trellis, hand rails, sanding and wood treatment. Time to start work on the overhead trellis. 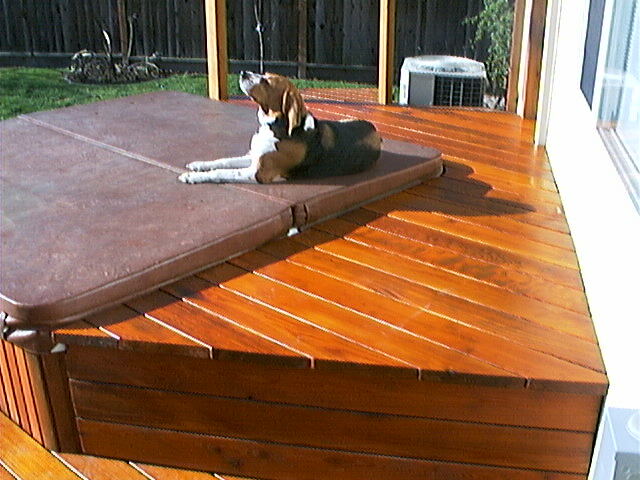 The beautiful redwood planks aren't looking so beautiful any more. 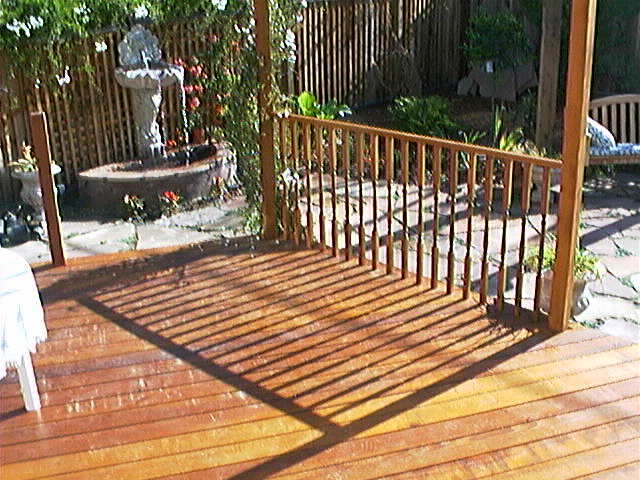 It is amazing how quickly wood decays in the bright California sun. I'm going to have to do something about that. 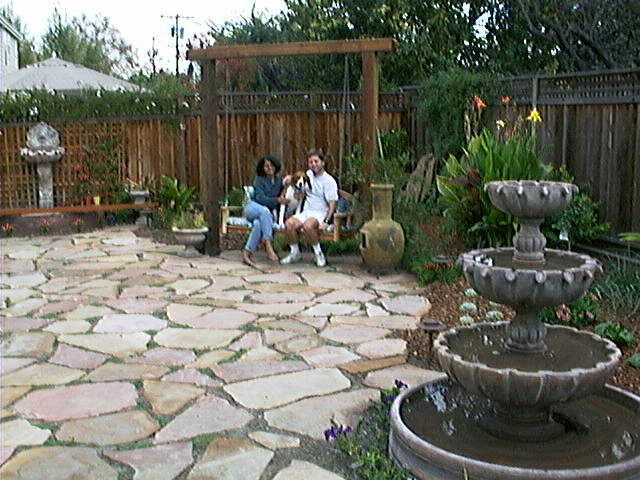 Jim from next door helped me work on putting up the overhead trellis. I rented myself a floor sander and I'm sanding the decayed top layer of wood off to reveal the beautiful redwood colour underneath. Monday (U.S. Labor day holiday) I finished the sanding, and then I had to get some wood preservative on it quickly before it started going grey again. I worked hard Monday evening, Tuesday morning before work and then Tuesday evening after work to get the first coat of wood preservative put on. Today I got up early to put the second coat of wood preservative on. 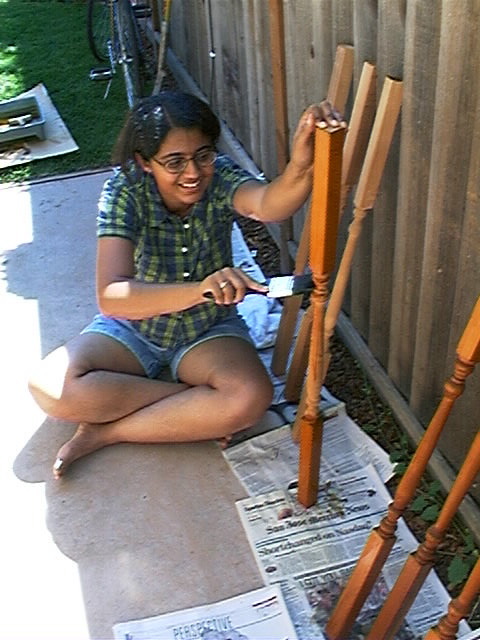 Meanwhile, Pavani painted preservative onto the posts for the hand rail. With Tom's help I installed the first of the hand rails. 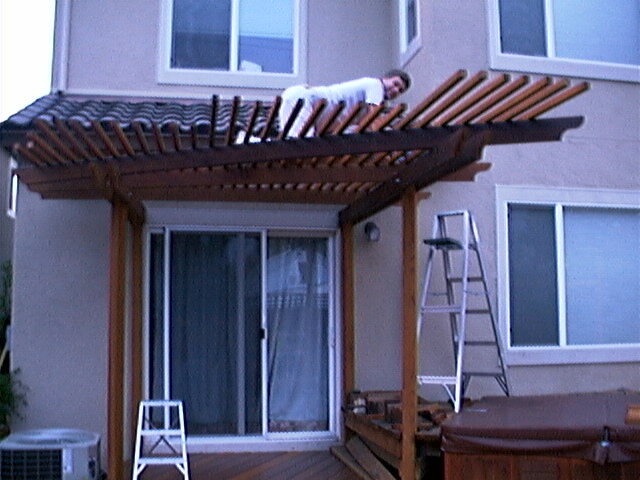 I spent the day installing the overhead trellis slats, including some dangerous crawling around on top of them while putting in the final screws. 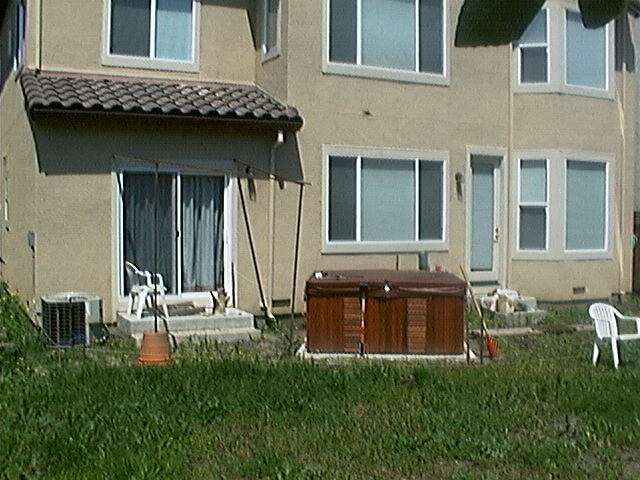 The garden landscaping is completed, and the plants are starting to grow. Finishing the Step and the Seat. After a long break, time to finish off a few remaining things. 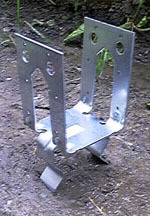 The step has to be sanded, treated, and finally bolted into place properly. The seating area is the last remaining piece that still needs wood preservative applied. Because of the lousy rainy weather in February, I removed all the planks so that they could be left to dry out in the garage, sanded, and treated in there where it is dry. Finaly, the seat is finished, and the planks are screwed back into their rightful places. It has taken almost a year, from start to end, but it's not over yet. Pretty soon it will be time to apply the top coat of Akzo Nobel Sikkens "Cetol DEK" wood preservative. I'm almost regretting buying a wood preservative that requires three coats. Still, the end result is worth it.